With the warmer weather quickly approaching I needed to update my wardrobe with fresh spring pieces. 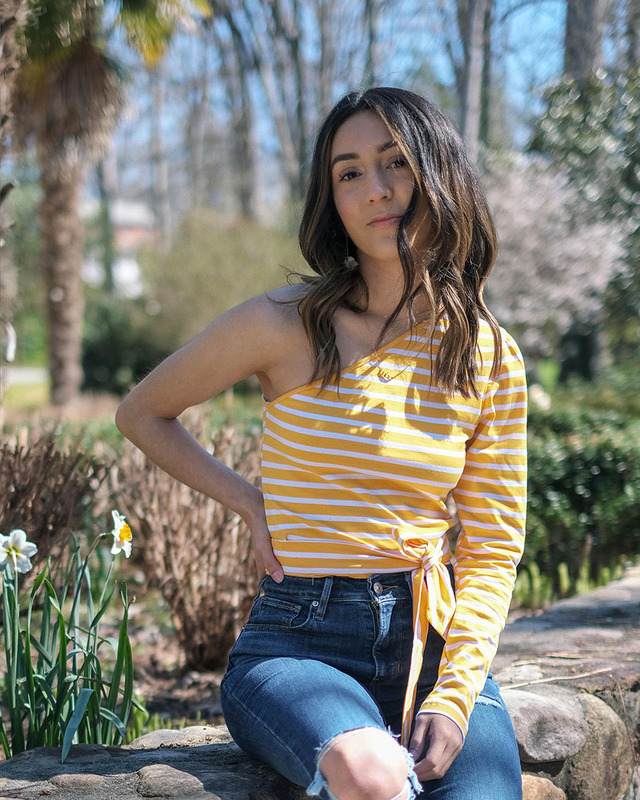 I headed to Walmart to check out their new spring collection and found three amazing pieces that I've styled for you all today. (Last year I did a similar blog post on one of my Walmart fashion finds, you can read it here). One tip I have when shopping is to always pick pieces that can be worn in multiple ways with many different outfits. That's just what I did with these three pieces! I'm going to break down my look by each individual piece and give a mini review on each item. The outfit was perfect for wandering around our new city. We just moved here in November and we have barely gone out exploring. We found this cute little meditation garden and it is such a gem. It was super peaceful with running water, birds chirping, and squirrels running around. It's just what we needed. We're so excited for the warmer weather and getting to know our little town more! These sandals from Time and Tru were one of the first items in my cart! They are so cute and this style of sandal will be everywhere again this spring and summer. They fit true to size - I'm usually a 6 or 6.5 and I went with the 6. They also come in white, which we all know will look amazing with a tan! These will be great to pair with just about every spring/summer outfit and even good for a day by the pool. Almost forgot to mention the best part, they're under $10. Major score! If you get one thing from Walmart, get these. By the way, they're selling out quick! One shoulder tops are super in right now so I couldn't believe my eyes when I found this cute little striped top. 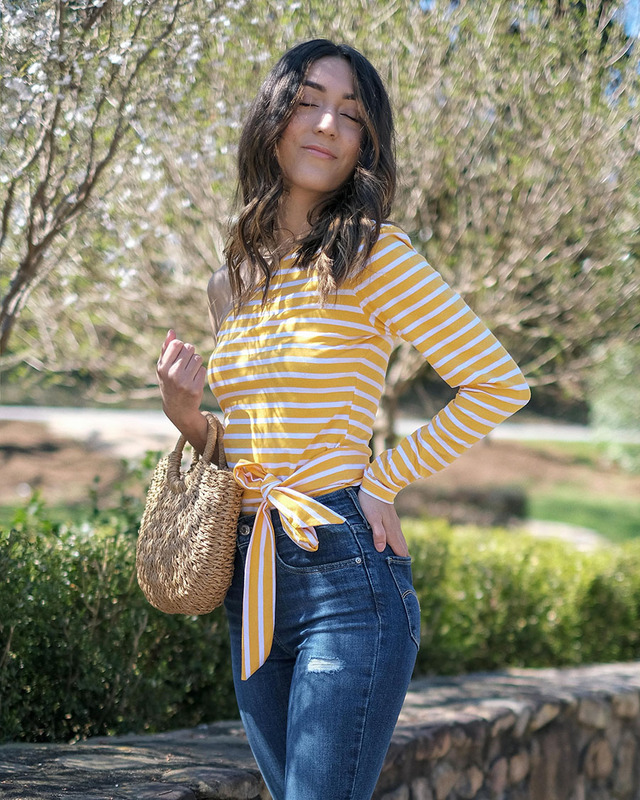 It's yellow, one of the best colors for spring and has a strap that ties into a bow around the waist. This top will also look amazing with white cutoff shorts or white jeans. 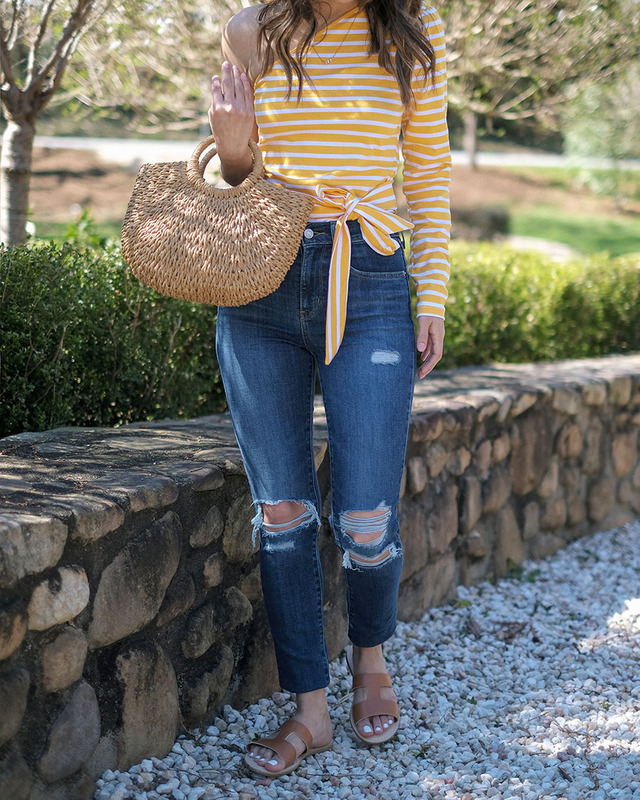 It's from the Sofia jeans by Sofia Vergara collection which is probably one of my favorite collections from their new spring pieces - tons of super cute jeans, I really love this pair. If you order anything from the Sofia collection you also get a little evil eye bracelet - it's a really cute touch. As far as fit goes, I got an XS and it fits me perfectly. My last find was this amazing pair of jeans that fit like a glove. They are a darker wash - one of the best washes because it's easier to dress up and literally go with everything, and they are high rise - a must have for all the cute little crop tops I'll be wearing for spring. They fit true to size, I always wear a 24 and these fit so well. One thing to note is that if you're petite like me (I'm only 5'2) then they will be a little long. I usually roll up my jeans anyways because I love the look so not a big deal for me. For these photos, I tucked the hems of the jeans in. One more thing I want to mention is that Walmart has free 2-day shipping on orders of $35 or more and they also have free returns - both of those are super important to me when shopping online! I love knowing that if something doesn't fit properly I can simply mail it right back for free. Check out more from the We Dress America campaign here. Let me know if you guys like these Walmart finds posts and I'll keep doing them!